IMPORTANT: All files included in these project packages are free to use in personal and commercial renders but may not be distributed, sold or shared in any way. Kozaburo's Long Hair Evo modified to look like NA male/female hair (redistributed with Kozaburo's permission). Body textures for Sara and Lee (male character for Sara 2, available in "Other Downloads" at 3dSC). NA dress, moccassins and armband + textures. NA male outfit and headdress + textures. Animal skin, blankets and cradleboard + textures. Plants, rocks, campfire, canoes, totem pole, fire striking utility + textures. Campsite, chickee and tipi + textures. Pueblo and pueblo chapel + textures. Household items, rattles and weapons + textures. 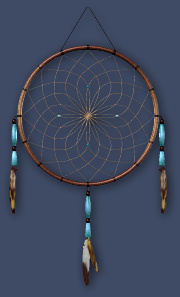 Months of work by a variety of talented individuals teamed together with a single goal in mind have resulted in the 3dSaraCreations Native American Project! 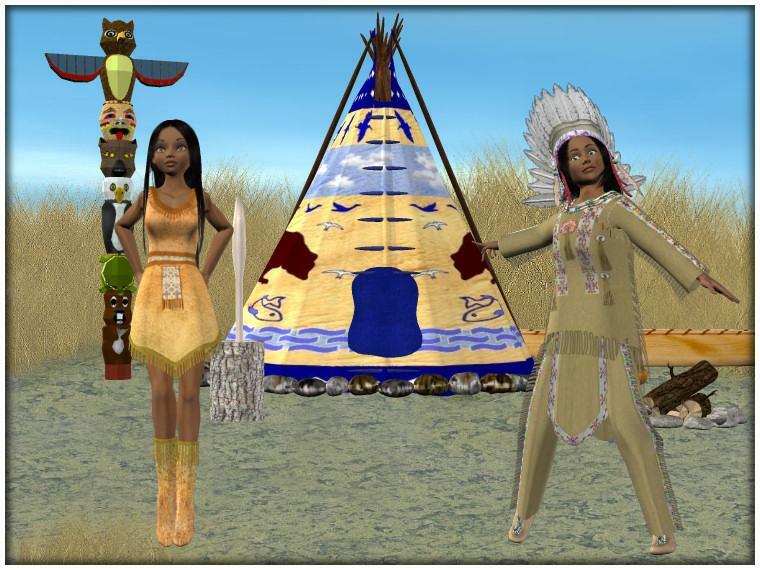 The 3dSC Native American Project consists of 134MB of themed content including male and female outfits, scene props (all character-based to allow for easy MAT creation for your own textures), tipi, chickee, pueblo and pueblo chapel, and many other models! We searched the Web for reference images and tried to offer you all you need to render beautiful NA scenes. A novelty with this project: there are models for Sara's male counterpart "Lee for Sara 2" who is available at 3dSC. With little tweaking, the male outfit and headdress should also fit Simon who is a character for Sara 1. 3dSaraCreations is a volunteer group dedicated to creating digital content for and about DarkWhisper's Sara (available for free download at Daz3d.com - Latest news forum). If you are interested in Character modelling or Texture creation, and would like to join the effort (or maybe teach us something, or learn something from other volunteers), come on over and register at 3dSaraCreations.com! We're a varied group, from experts to beginners, and there's room for every level of skill and/or ability to participate. Anniebel, Archie10, Calalene, Cedarwolf, Chohole, Contajen, France, Gaetan036, Humble, NeilP, Netta, Peanut, Posfan, Realmling, Tigger, Wraith and Xantor. The 3dSC NA Project Team Admins are France, NeilP and Realmling. A special THANK YOU to Kozaburo for his permission to redistribute his Long Hair Evo for Sara, modified to fit our theme!